Jimmy Buffet sings a song to trump, one of his best! 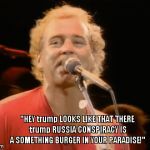 trump Russia Conspiracy is a Something Burger in Your Paradise! "HEY trump LOOKS LIKE THAT THERE trump RUSSIA CONSPIRACY IS A SOMETHING BURGER IN YOUR PARADISE!"